Newfoundlands are legendary for their strength and athletic ability in and out of the water, and for their gentle, yet fearless nature. This breed developed in Newfoundland, off the coast of Canada, but its origins are nebulous. The Basques, Norse and other explorers to the Atlantic Coast are credited with bringing this dog to the island, but it is also believed that the breed was developed by selectively crossing European dogs with native dogs found by explorers to the area. The Newfoundland has a stiff, oily outer coat and a fleecy undercoat, allowing it to adapt to harsh and cold conditions. Webbed feet make him an ideal swimmer, and because of this physique, Newfs frequently accompanied fishing vessels and performed life-saving rescues. The dogs helped haul nets, retrieve objects and people from the water, and their lung capacity allows them to swim long distances against fierce currents. Newfies were also used on land to haul carts of fish, milk and mail! Newfoundland legends abound, but many have been cited by multiple soures. A famous Newfie named Bob was known to have rescued over 20 people from the Thames River, Great Britain, in the 1830s, and received a medal from the Royal Humane Society for his efforts. Two decades later, a Newfie named Wallace stopped a mutiny on the U.S.clipper ship Dreadnought simply by standing up and placing his paws on the mutineer. In Great Britain, Sir Edwin Landseer, a famous animal painter, depicted a Newf rescuing a boy and pulling him to a beach. Landseer painted and drew many other Newfoundlands, but he is best known for giving his name to the black and white Newfoundland often depicted in his works. Today, Newfoundlands are used in search and rescue missions by many countries, and Italy even has a training school for the dogs, which are used in their Coast Guard service. Many Newfie videos are available from Google and other sources, but please also reference the Museum's video of Leo performing a mock rescue in 2012 in Maryland! Leo is a Landseer-type, and a talented swimmer. Visit our Facebook Page to view the 2012 video of Leo. Featured in the following video footage: Spinner porpoises, Chinese White Dolphins and other porpoises and dolphins. These marine mammals (cetaceans) are closely related to whales. There are 40 species/subspecies of dolphins and only 6 of porpoises. Though they may appear similar at first glance, these mammals have many physical and social differences. Both are extremely intelligent and have large, complex brains. Dolphins have conical teeth, a curved dorsal fin and a long beak and bulb-like head. They can range in size from 4 to 30 feet. Porpoises have spade-shaped teeth, a triangular dorsal fin and a small, rounded jaw and head. They can range from about 5 to 8 feet long. Dolphins are extremely social and live in pods or superpods, depending on the availability of food. They communicate with several vocalizations, including clicks, whistles and ultrasonic sounds, by which they locate each other as well as prey. Dolphins can establish strong social bonds. Porpoises are shy and travel alone or in very small groups which change frequently. They also use echolocation to find prey and sometimes to coordinate their group activity. They generally do not establish social bonds. Dolphins are playful with each other, with swimmers and sometimes with other creatures such as sea birds and turtles. They often ride the bow waves of boats. These marine mammals can live in aquariums and can be trained to perform a variety of acrobatic tricks as well as underwater military tasks. Porpoises do not generally do well in captivity and are less sociable and trainable. Several breeds of small cats throughout Asia and Eurasia live in marshland, swamps or riverbanks. These cats inhabit the Caspian Sea area, as well as China, Sri Lanka, Myanmar, India and Indonesia. Their habitats are shrinking, and these cat populations are dwindling as development encroaches. Asian fishing cats come in varying grey and brown colors, and their coats combine stripes and spots. Their feet are semi-webbed, enabling them to swim on the surface as well as underwater. They can use their tails as rudders. In addition to diving to catch fish, these cats also use their paws to scoop up other prey such as frogs. Some of these cats also hunt small mammals and birds which populate the shoreline. The cormorant is a beloved and ancient bird inhabiting the world's shorelines. Cormorants were revered by early explorers and seal hunters because they never venture far from their shore nests, and were a positive indicator of approaching land. Various types of cormorants reside or migrate to the arctic and antarctic regions, as well as the six continents. They are commonly seen along the Chesapeake Bay, often nesting near piers or docks. In parts of Asia, Cormorants have been domesticated and used as fishing birds for centuries. In Japan, this ancient tradition is protected by the Crown, and only a few families have hereditary rights to fish with cormorants. The birds's necks are banded when they enter into training, so that when they fish, they can retrieve large fish without swallowing them. They are tethered to their boats, and after bringing in their catch for the day (or night), they feast on small fish. Nightime fishing is a time-honored ritual in Japan, and torches are extended from the prows of the fishing boats, to assist the birds and fishermen in spotting fish. These birds are nurtured and worked by one family throughout their lifetime, and are an important partner in an age-old trade. Cormorant fishing is also a revered practice in China and Korea. 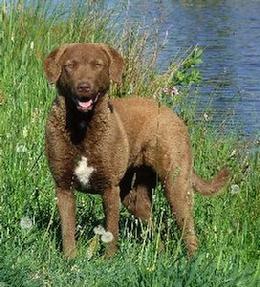 The Chesapeake Bay Retriever is a well-known working dog on local waters, as well as in Canada, Great Britain and Scandinavia. Chessies are known for their extreme intelligence, loyalty, strength and ability to endure the most rugged weather and water conditions. They excel in retrieving game. The breed originated in the United States in the early 20th century, and were used to retrieve waterfowl. It is believed that they were bred from Lesser Newfoundlands and local hounds. They are related to the Curly-Coated Retriever, indicating that they probably have English or Irish Water Spaniel or Otterhound in their history. Chessies are friendly with strangers, and gentle with children. They love a country environment, and daily work!